Cuzco was actually finished about a month ago but I didn't get a chance to take photos. Yep, I decided to call it Cuzco. I'd been calling it Cuzco since the day it was cut out and no amount of trying to think of a fancy pants name paid off, so Cuzco it is! This quilt took me a year and a half to make, though I pretty much only worked on it at Guild meetings, which used to be every six weeks, but then changed to monthly, so I don't think that's too bad! The pattern is Stained Glass by Sarah at Narcoleptic in a Cupboard. She ran it as a QAL in 2012 (you know me, always up there with the latest trends!) and the pattern is free and very easy to follow if you're interested in making one. 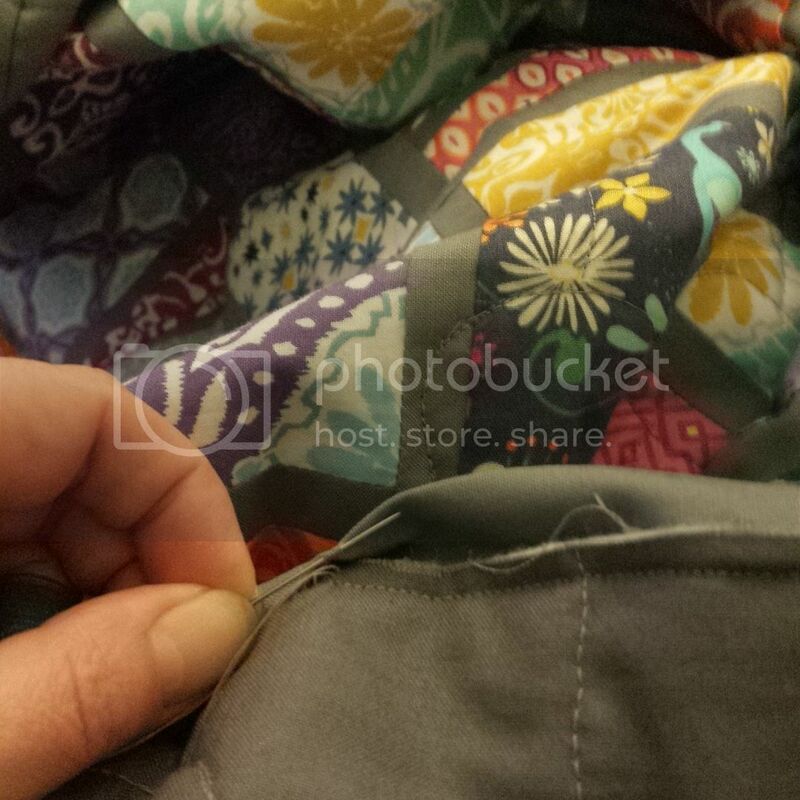 The fabric is a F8 bundle of Cuzco by Kate Spain that I nabbed on an Instagram destash. I used Kona Steel for the sashing and binding. 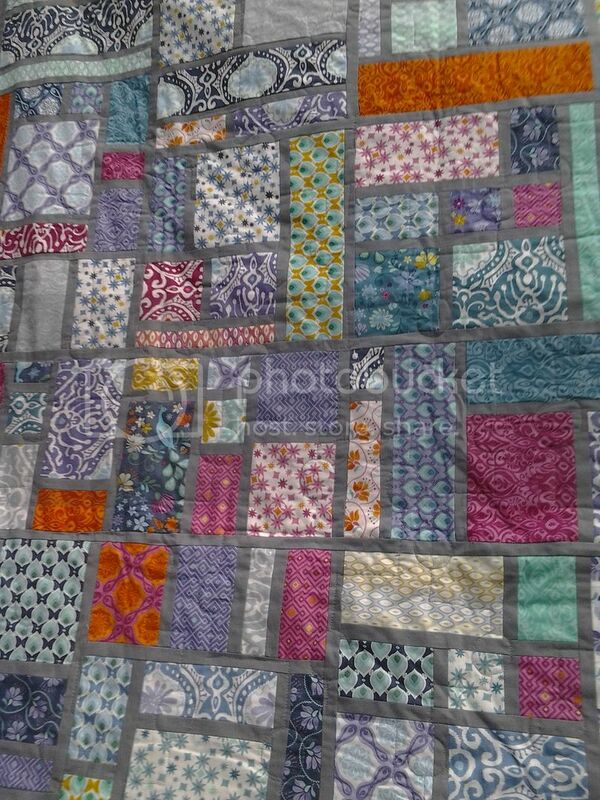 I quilted it myself using the Angles and Circles pattern from Leah Day's 365 Quilt Designs book. 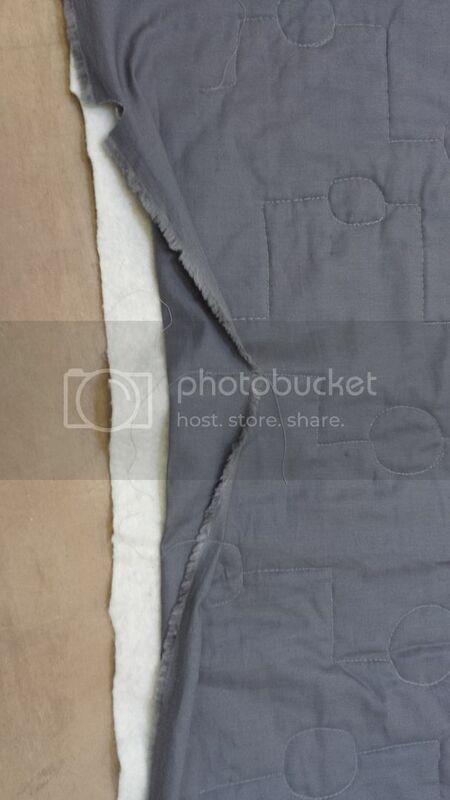 The back was pieced out of necessity. I used a large piece of one of the Cuzco prints (I'd bought 3 yards following Amy Butler's instructions when I made her Weekender Bag, this was the lining, and it was far, far too much), a large piece of a Klona grey in a similar shade to Steel, a strip of pieced leftovers and a piece of blue/purple fabric I happened to have hanging around that I thought might go! 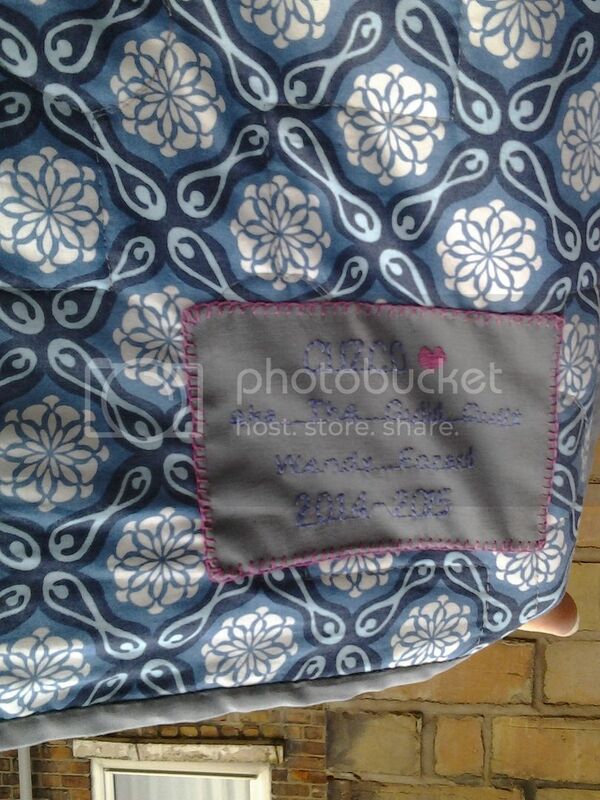 Then I stitched a label on my Janome, blanket stitched it in place by hand using pink embroidery floss, and took a picture of it upside down. That there is my real name, not the spy name I usually use on t'internet, so if you're really curious, you can have an upside down squint and find out who I REALLY am! I'd like to wish you all a Happy New Year's Eve. Ours will be spent in front of the TV, cheese board on the coffee table. Wine for Mr CA and coffee for me. It was going to include Junior CA but I told her our plans and that I'd probably be in bed by 10 and she elected to go to a party at her friend's house instead. She is 16 so I don't blame her. Happy New Year everyone, I hope it is happy and healthy for you all. I hope to see you around the Blogosphere in the new year and hope that you'll still come to visit me. I don't have any resolutions or special plans, I'm going to try to concentrate on being happy. Well done - looks lovely! 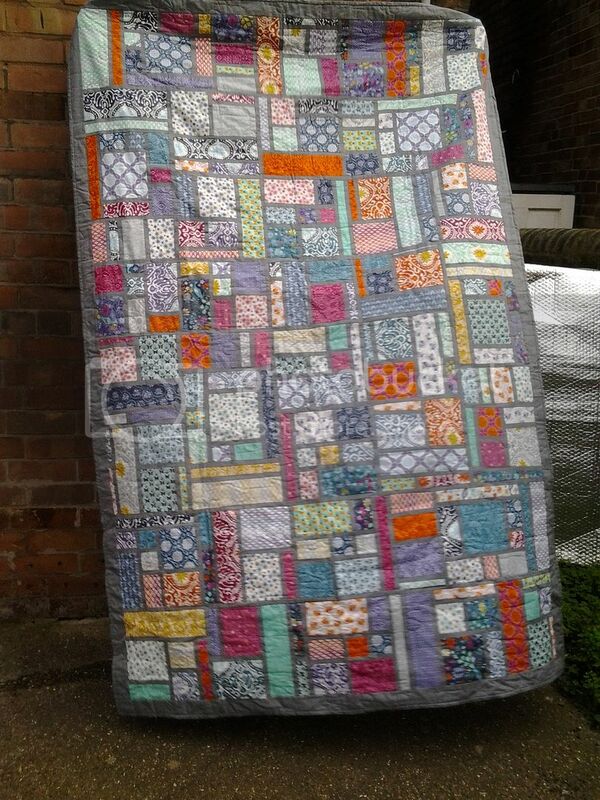 Your quilt looks fantastic - a real labour of love that has paid off. Happy New Year and enjoy your crafting in 2016. WENDY Cuzco looks fantastic! That would be an awesome way to use up fabric scraps too. My scraps are sorted by colour - I can picture using up the scraps in one colour with a co-ordinating colour for the sashing (like orange scraps with blue sashing, or pink scraps with grey). 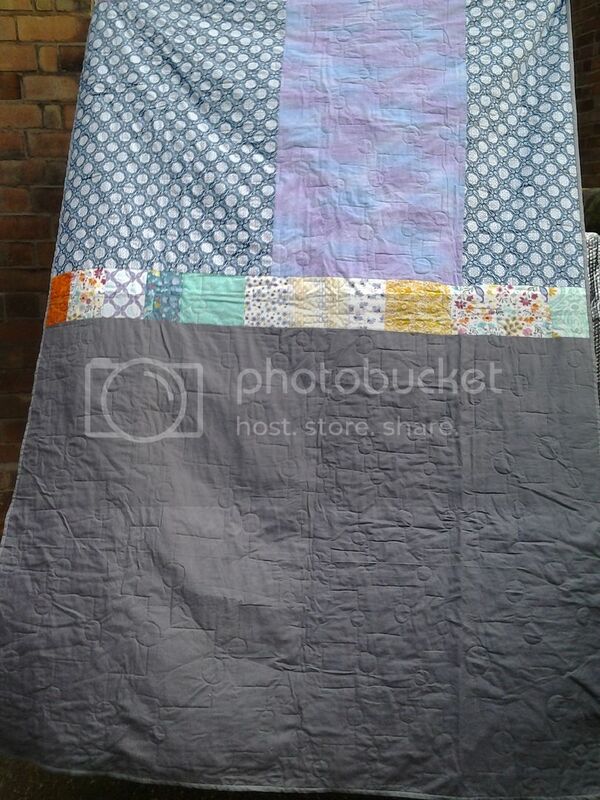 BTW - I think a pieced quilt back is better than a planned-out-and-bought-enough-fabric backing - especially when it co-ordinates with the front :) Sweet label too - what a fantastic finish to close out the year! Oh - and BTW - there isn't a sewer or quilter around that hasn't done that exact same oops - whether it was with the sewing machine, or with a rotary cutter - I've done both, lol! 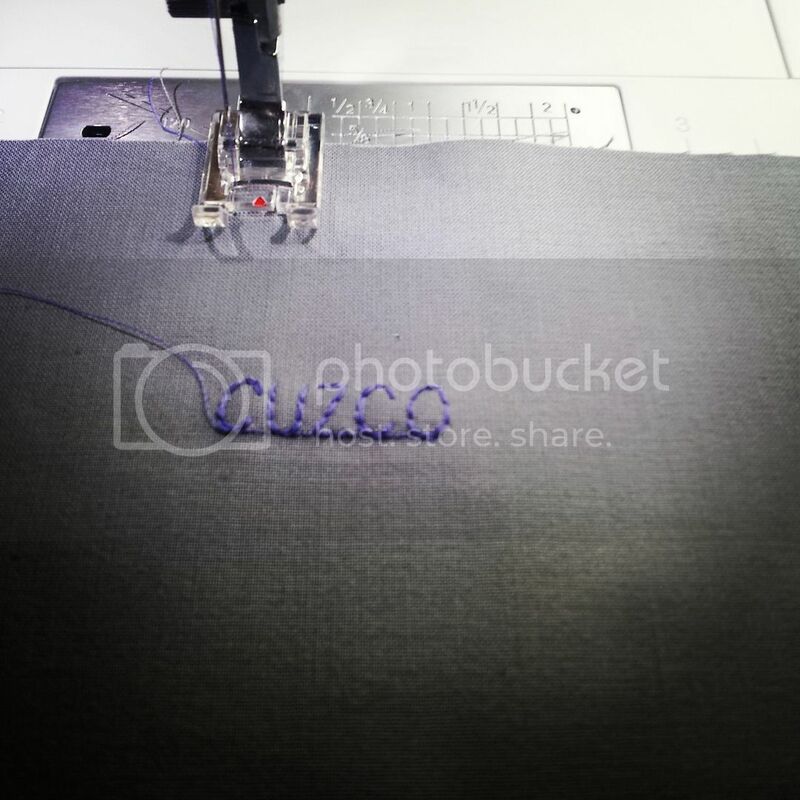 Sometimes you lose a piece that you've cut out, search high and low without success, and then find it stitched behind or between part of the project - I believe it's a rite of passage for sewers, lol! 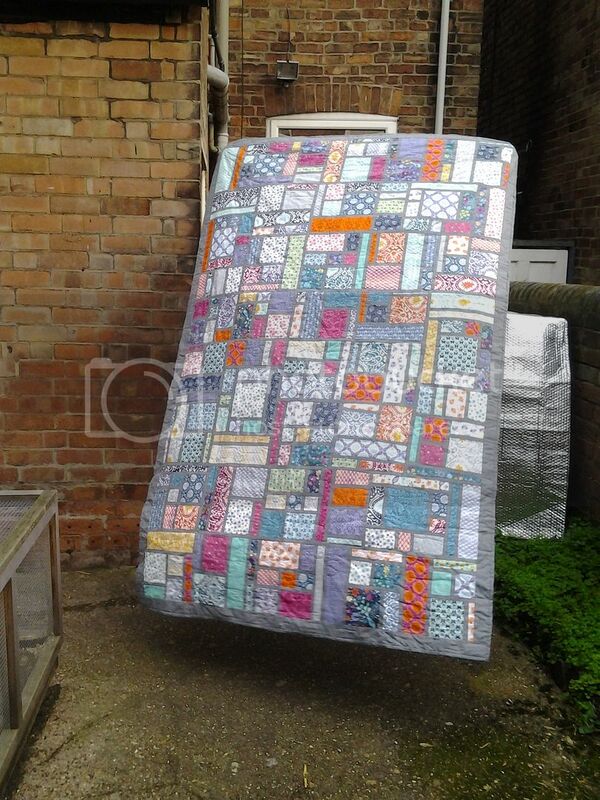 Such a lovely quilt Wendy! A Happy New Year! Congratulations on it, and on your lovely new sewing machine. Oh, it's beautiful! Amazing job. Congrats on finishing it!